On October 14, 1960, at an impromptu speech at the University of Michigan, John F. Kennedy presented an idea to a crowd of restless students for an organization that would rally American youth in service. Though the speech lasted barely three minutes, his germ of an idea morphed dramatically into Kennedy’s most enduring legacy - the Peace Corps. From this offhand campaign remark, shaped speedily by President Kennedy’s brother-in-law, Sargent Shriver, in 1961, the organization ascended with remarkable excitement and publicity, attracting the attention of thousands of hopeful young Americans. 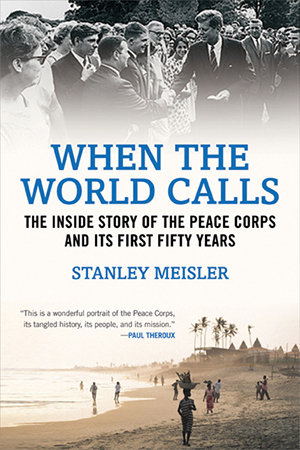 Not an institutional history, When the World Calls is the first complete and balanced look at the Peace Corps’s first fifty years. Revelatory and candid, Stanley Meisler’s engaging narrative exposes Washington infighting, presidential influence, and the Volunteers’ unique struggles abroad. Meisler deftly unpacks the complicated history with sharp analysis and memorable anecdotes, taking readers on a global trek starting with the historic first contingent of Volunteers to Ghana on August 30, 1961. The Peace Corps has served as an American emblem for world peace and friendship, yet few realize that it has sometimes tilted its agenda to meet the demands of the White House. Tracing its history through the past nine presidential administrations, Meisler discloses, for instance, how Lyndon Johnson became furious when Volunteers opposed his invasion of the Dominican Republic; he reveals how Richard Nixon literally tried to destroy the Peace Corps, and how Ronald Reagan endeavored to make it an instrument of foreign policy in Central America. But somehow the ethos of the Peace Corps endured, largely due to the perseverance of the 200,000 Volunteers themselves, whose shared commitment to effect positive global change has been a constant in one of our most complex-and valued-institutions. "Drawing on his experience and interviews with former volunteers, [Stanley Meisler] presents the fascinating characters, locales, and political background noise from a near-universally admired program’s 50-year history."